The development of Market Street, Union Street and Needham Street. The rectangular area of land bounded by Market Street, Long Acre, the western fence of Needham Street car park including the former Primitive Methodist Chapel (now the Horse and Plough public house) and Union Street was developed by a consortium of local business men between 1807 and 1810. Most of the buildings of Needham Street and Union Street were demolished in the ‘slum’ clearance of the 1950s. Since the late 1600s, the land had belonged to the Needham family who were graziers. At least some of the present post office house could date from that time. The grandson of the original grazier became a surgeon and married well. The surgeon, Matthew, moved to High Pavement in Nottingham and after his first wife died he married the sole heiress of a hosier manufacturer from Wilford. His son, another Matthew, became a hosier, married well himself and in 1801 built Lenton House, at the south west end of what is now the University campus. The family retained ownership of the Bingham property until 1801 when it was sold to the then tenant Joseph Dodsley Oliver, a wine and spirit merchant. His occupation may have led to the later use of the house as the public house ‘The Vaults’. The consortium bought the land but not the house from Oliver in 1807. Needham Street was clearly named by the developers for the original family. A common assumption is that Union Street was so called because the first workhouse, operated by the Poor Law Union, was built here. However, that was actually in Moor Lane, but a temporary workhouse may have been here (See entries for Moor Lane and Union Street on Street Names page). An Abstract of Title found with the bundle of deeds to White Lodge, 7 Church Street, throws some interesting light on the history of the area bounded by the southern end of Market Street, Union Street, Needham Street and Long Acre. More research of deeds and other material perhaps in the Archives office is needed to enlarge the picture. The abstract is with the papers for White Lodge because at one time George Baxter, a party to the development of the property described in the abstract, owned the property in Church Street which was later rebuilt as the Georgian house we see today. The abstract was written to demonstrate the title of George Baxter and others ‘to premises at Bingham’ sometime after 1812 and possibly in 1823 at the time of his bankruptcy. Baxter and others had formed a syndicate to develop some of the land previously in the ownership of the Needham family. The abstract starts with them. The first entry records briefly the granting of letters of administration on the 9 May 1694 to Sarah Needham following the death of her late husband John Needham (whom we shall call the first) then of Bingham, who had been the sometime purchaser of the premises described below. He may have purchased the property about 1660/70 but further research would be needed to establish any useful information. There was a house here already or he may have erected one when he bought the land. The central chimney and inglenook fireplace of the present post office house imply a date prior to 1760, but we do not know if any part dates from the 1660s. and Sarah Needham, spinster, were parties to the agreement- presumably giving up any claim they might have. [One wonders if Tailby is a misspelling or an alternative spelling of Tealby, which would make Ann the wife or possibly daughter in law of Thomas Tealby who left money for charitable purposes in 1721.] The indentures set up a trust to ensure the proper succession of life interests in the property for his mother (Sarah Needham), himself, his wife to be (she had only a life interest) and their lawful heirs. The indentures listed other properties so Needham was clearly well off. Trustees were Heyrick Althorpe, gent of Nottingham (presumably the Needham's lawyer), Thomas Evans, clerk of Bingham and William Shepeardson, yeoman of Bingham. This last named may have been an early version of the name Shepperson, a long established Bingham family name. It is not until later in the abstract that we get to discover the land is bounded by Market Street and Long Acre. The messuage may well have been part of the building once the Vaults Hotel and now the post office and house - it is probably of the right date. Thus the Vaults may have been built as a substantial farmhouse. It is unusual for a property in Bingham of this nature not to have been in the Shelford estate of the Earls of Chesterfield. John’s mother Sarah died in 1725. By this time he had married Sarah Toone and had a son, another John (the third). This John married a Sarah Brown but died within his father’s lifetime without issue. John (the second) and Sarah (Toone) had two more sons, Matthew and William and two daughters (not named in the abstract). Matthew was the eldest and became heir at law. all that messuage farmhouse with homestead and also two acres of land thereunto adjoining which said messuage and premises are situate lying and being within the parish or liberties of Bingham and in occupation of said John Needham the elder. He also owned 37 acres of pasture and common pasture for cattle which would have been spread around the parish in smaller parcels. In 1758 an agreement was drawn up on behalf of Matthew, described as a surgeon, and his wife, Martha. She was the daughter of a wealthy wine merchant of Romford, Thomas Machiter who had already conveyed an estate to Matthew as his part of the marriage settlement. The Bingham homestead is now described as having an orchard – these were common in Bingham in later years and perhaps the mention of an orchard at this time tells us something of when they started to develop. Matthew was clearly becoming a man of substance. 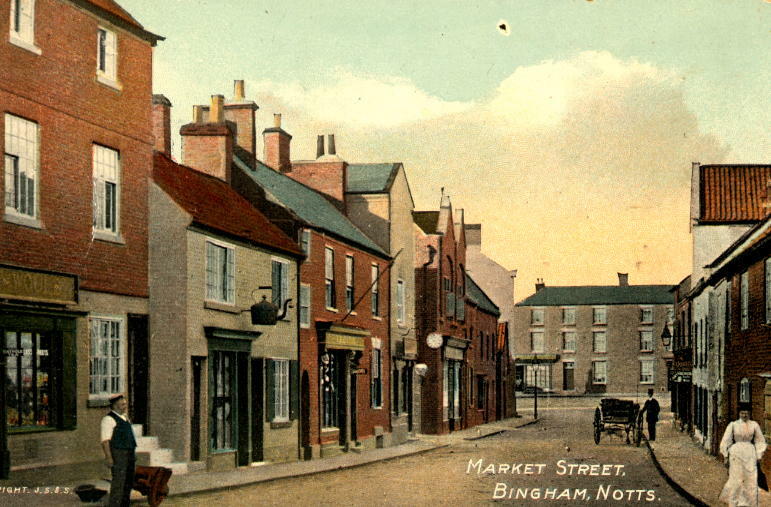 He and Martha had three children, a son John born in Bingham who died before being baptised; Thomas born in Nottingham who died aged six months and Ann born in Nottingham who died aged two or three. The abstract does not say when Martha died. Clearly Matthew (and Martha) had moved to Nottingham (in fact to High Pavement, see below), and in 1766 another pre-marriage settlement is recorded this time between Matthew and his second wife, Sarah Lee, daughter of William Lee a hosier of Nottingham. William Lee paid £500 to Matthew, presumably by way of a dowry and Sarah Lee received a life interest in Matthew’s property in Bingham. The abstract records that Matthew and Sarah had one son, another Matthew, and two daughters. Messuages and estates in the town of Nottingham, messuages and three closes in Wilford, estates at Newton and all the said premises in Bingham. Joseph Dodsley Oliver is described in the 1822 directory as a tanner and wine and spirit merchant of Long Acre. Can one assume this was the beginning of the former use of 37-39 Long Acre as the Vaults public house (see Long Acre)? Adrian Henstock, in his book ‘Tracing the history of your house’, uses as an example Lenton House, which turns out to have been the mansion erected by Matthew Needham (the younger). It stands at the south west corner of the Nottingham University campus and is now owned by Boots. The main house was built in 1800. Mr Henstock’s account sheds more light on the Needhams. This description places the land pretty conclusively as that part of Market Street and Union Street adjoining the present post office house. The rectangular piece between Long Acre, Market Street, Union Street and the fence between the Needham Street car park and the drive to Buttercross Veterinary Practice measures (by pacing not by tape) just about 8885 sq yds. Thus the area occupied by the post office house was excluded and it probably is the original home of the Needham family. Needham Street is named after the family, not just because they were a well-known local family but also because it is on what was their land! The papers are silent as to whether there were already other buildings on the site. As it is described as an orchard (and indeed was such until the 1950s when the bungalow demolished in 1998/9 was built). There may have been outbuildings, and possibly even a cottage which might be the western portion of Butlers (7a Union Street). The present owners of Butler’s tell of a passage from Butler’s outbuildings to what is now the post office yard that people in recent memory used as a short cut from Long Acre to Union Street. George Baxter, grocer, linen and wool draper, Church Street (see White Lodge). He was also an agent for the Southwell Bank. Henry Crooke, publican of the Blue Bell, Market Place. Clearly we have here a consortium of local trdesmen and businessmen, but interestingly they did not use their own money but borrowed the purchase price from Joseph Oliver and Ruth Timms! An agreement of 1810 records that John Strong left the consortium and that by then they had built six premises in (presumably) Market Street, Union Street and Needham Street. They probably also built what are now numbers 33 and 35 Long Acre (now two shops, but clearly originally one building as shown by the old matching window lintel over the ‘new’ door, the line of the plinth and the pair of boot scrapers astride one door) adjacent to the post office and clearly younger than it. William Huckerby (in 1822 a linen draper of Market Place). The Huckerbys were also later auctioneers and William Huckerby junior built Cromwell House. Richard Pilgrim in 1822 a painter. Samuel Brown (in 1828/9 a Watch & Clock Maker of Market Street. This was probably the stuccoed corner town house which on the post card of 1901 (below) has a clock mounted on the corner) William Wall, Samuel Price, Jonathon Shipman, Robert Seymour and John Mackley, none of whom are listed in the directories of 1822 or 1828/9. Market Street, looking north. This is a coloured picture used in a postcard, published by J.Sands & Son. This one was posted on 28th January 1917. Reproduced by permission of Greg Franks. In 1812 the consortium repaid Vickers’ loan in full. The abstract ends with this repayment. So far we know little of the history of the development after this date. In 1807 George Baxter had inherited the property which became White Lodge, 7 Church Street from his uncle. But also in 1807 he took out a loan of £500 and by 1823 had become bankrupt. Whether his involvement with the Market Street consortium played a part in his downfall we do not know! Directories between 1822 and 1855 throw some light on the subsequent uses of the Needham’s former house, and indeed raise questions we will try and answer during 2004 about the development of various trades in Bingham. In 1822 Joseph Dodsley Oliver was listed as a tanner and wine and spirit merchant. By 1828 he had added bobbin net making to his activities. The same description appears in 1832. The 1841 census lists Joseph Oliver as aged 60 with daughters Fanny, 20, and Ann, together with son Joseph, 15. No occupation was recorded for the children. By time of the 1844 directory he had reverted to wine and spirit merchant. Mary (Fanny?) and Ann were listed as dressmakers. The family is also recorded in the 1851 census, by which time Fanny and Ann had left, presumably to get married. Joseph had joined his father in the business. The last directory reference to the Olivers is 1855. In 1869 and 1879 Samuel Hall is recorded as a brewer and wine/spirits dealer, following the Olivers’ business. By 1893 Henry Johnson is recorded as a wines and spirits merchant and Innkeeper of the Vaults. Richard Thorpe had the Vaults during most of the 1920s, his widow Bridie is noted in the electoral register as being in Long Acre for 1928 but the hotel is no longer named. It had probably closed after what would seem to have been 125 years in business as a hostelry. The Post Office moved here from the Market Place in 1936/7. It would be nice to know its function in between these dates!